With Penn’s Alumni Weekend running from May 15th through May 18th this year, we’re taking the month of May to salute some of our amazing M&T alumni. This special A Day in the Life post comes to us from M&T alum Matt Owens, currently Executive Director of Harlem Biospace. Please briefly describe what industry you’re in and what your particular position entails. I helped start a Biotech incubator in NYC called Harlem Biospace. Running this organization involves first and foremost supporting the companies working from our lab in any way possible ranging from helping them secure resources and talent to talking through their plans for their ventures. Beyond supporting the teams working out of our lab we serve as a gathering point for the growing life science community of NYC, and our broader goal is to accelerate development of this sector in the city. This can range from partnership development for expansion of the biospace to software development for cataloging underutilized core facility resources at nearby Universities. What time did you get up this morning before work? This morning I woke up at 6am to run and write before going into the lab. I try to keep to this schedule to force some structure into the day but have to admit that the success of this can vary widely by the week. What time did you start working, and what time were you done for the day? Given that the Biospace is itself a startup there are always more things that can be done. I typically try to be out of the lab by 6pm though I am likely to continue working elsewhere after a dinner with friends or other event in NYC. Birch coffee and my old company General Assembly are two favorite places for this. What were some of the projects you worked on today? Today we started the morning at Hb with a visit from a pharmaceutical company’s head of acquisitions to discuss collaboration in the future to support life science companies emerging from NYC institutions. Right afterward we gave a tour to an NYU faculty member intending to spin-off his research into a company and considering applying to base the venture at Harlem Biospace. Later in the afternoon I attended the press release at Rockefeller University about the NYC Early Stage Life Science Fund – a new $150 million venture fund focused on investing in companies such as the ones working from Harlem Biospace. After this I returned to the lab where we hosted a seminar on confidentiality agreements. Between meetings I was answering emails and working on the code for a collaboration platform to facilitate greater collaboration among academic researchers and among science-based ventures that we are calling Synaptic (http://synaptic.nyc). Who specifically did you interact with today, besides coworkers (clients, interns, researchers, executives, founders, etc.)? One of the things I love about this job is I have the opportunity to meet a wide range of people across the spectrum of basic science researchers to Biotech investors and advisors. I spend the most time with the scientist entrepreneurs working out of the Biospace, but I also end up meeting with a variety of others interested in engaging with NYC biotech – whether it is pharma or biotech companies seeking curated external innovation, investors watching for future portfolio companies, service vendors seeking to build relationships with growing ventures, or researchers who intend to eventually transition their career from basic research to commercializing their work through startups. Are you currently traveling or about to travel for work? Meetings for the Biospace are usually within the city, but there are industry events we attend throughout the country to represent NYC biotech such as the annual BIO convention which was in San Diego last year. Since graduating I have lived in SF, Boston, DC, LA, and NYC. By personality I tend to travel spontaneously to keep in touch with people in these cities. Friends are in general a priority for me regardless of how busy work might seem. What was your favorite part of the workday? Usually early evening is the most crowded time for the Biospace. Teams that were working during the day overlap with our segment of moonlighting individuals who work on their ventures after hours when they finish their day job. At this time of day people are ready for a break and it’s when we tend to have the most interesting discussions and ambitious brainstorming for future plans of both their products and the Biospace community. What are some of the challenges within your position that you particularly enjoy? Prioritizing programs we undertake is a challenge given the broad mission of catalyzing NYC life science. While at the moment we support the teams in our space with as much personal time and connections as we can – we hope to over time build a much more robust program for the incubation of life science companies within the city that integrates physical lab space with seed stage funding, access to specialized talent, and standing agreements with core facilities, CRO’s, and corporate partners for services often inaccessible to early ventures. Seeing ways to weave these areas together efficiently is a challenge, but it’s part of what makes this job exciting. How did you end up in your current position or school? It has definitely not been a straight path. After graduation from M&T I joined a financial services startup called Gratio Capital where we worked to expand accessibility of investments by offering goal based savings gift-cards which were tied to time-horizon appropriate mutual funds that we ran. Work with this team was interrupted when I received a grant to continue my Penn thesis work around water contamination testing with a partner University in Kolkata. Upon returning from this I joined a management-consulting group in Boston called Stax. After about a year with Stax I joined a media startup just getting off the ground in DC that unfortunately didn’t find the traction we needed. Luckily, however, at the same time I reconnected with a former colleague from the Wharton Small Business Development Center (SBDC) who had just started a group called General Assembly. I joined the early team and helped build the first education products that allowed GA to grow from 8 to 200 people across eight cities in under two years. A journalist friend recognized the similarities between General Assembly and Harlem Biospace and put me in touch with the original founder of this. A couple of phone calls and a dinner quickly turned into me joining full-time. How did M&T help prepare you for where you are today? A key component of my work today on Harlem Biospace is bringing together a very diverse group of people, ranging from researchers at New York institutions like Rockefeller and Sloan-Kettering to investors and marketing professionals. It’s a credit to M&T that I can feel comfortable jumping between these contexts. What advice do you have for those who might be interested in pursuing a similar path? Most M&T’s by the nature of being interested in both engineering and business have a broad range of interests. I would say don’t be afraid to explore multiple paths before setting down any one too far. You will often find that experience in one realm provides surprising benefit to new work, and even if not, you will have built up a diverse network of friends and acquaintances which just makes life more interesting. It might sound cliché, but if you aren’t yet sure which path you want, a great strategy is to just pick projects where you will work with the best people possible who you will learn from and be motivated by. 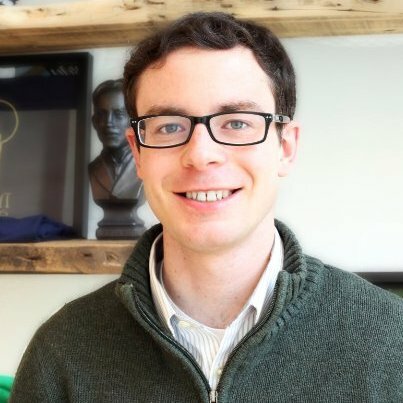 Matt is currently Executive Director of Harlem Biospace in New York. He graduated from Penn and M&T in 2009 with a Bachelor of Science in Mechanical Engineering and Applied Mechanics from Penn Engineering and a Bachelor of Science in Economics from Wharton with a concentration in Management. He also holds a Masters in Mechanical Engineering – Integrated Product Design from Penn Engineering. In his spare time, Matt enjoys running and traveling to his favorite spots in Darjeeling, India and Los Angeles.